All good matched betting sites provide a range of matched betting software. 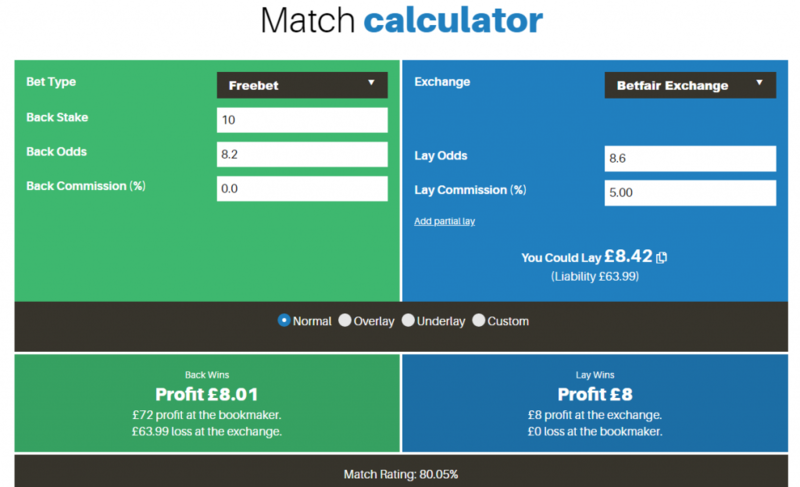 These can be matched betting calculators to help you determine ideal lay stakes, dutching software, EV calculators, horse racing matchers or odds matchers for example. Odds matchers are one of the most used tools for any matched bettor. They allow you to almost instantly find an event where the bookmaker back odds are close to the lay odds for the same market on the exchange. This allows you to incur smaller losses on your qualifying bets and generate maximum profits from your free bets. The Odds Matcher available to Profit Squad members has a lot of useful features. You’re able to filter results by bookmaker, sports, exchange, markets, min/max odds, level of liquidity and much more. It also updates in real time so there is no need to refresh the page to check if the odds have changed. However, there will come a time when you will need to find our own match. This may be due to a new bookmaker which hasn’t been added to the odds matcher yet or if the bookmakers odds feed is unavailable. In this guide, we’ll show you the best way to find your own match without using an odds matcher. What is a ‘good match’? Finding a match using an odds matcher is easy. You click a couple of buttons and it will show you the best matches. However, finding a match manually is a little more challenging. After all, what makes a good match? We know that the bookmaker back odds need to be as close as possible to the lay odds on the betting exchange, but how close? To answer this question, we will split it into two sections. Qualifying bets tend to be placed at relatively low odds. There may be minimum odds set for your qualifying bet but generally, the lower the odds on a good match, the lower your qualifying loss will be. This also applies when using bonuses or meeting wagering requirements. Ideally, we’d like to find matches with a qualifying loss of no more than 5%. If you were using an odds matcher, the ‘match %’ is generally displayed. The screenshot below shows some matches around 95% which equates to a 5% qualifying loss. This means that if you were placing a £10 bet, you’d make a £0.50 loss (5% of £10). To find a close match manually for your qualifying bets, simply compare the odds on the bookmaker to the odds for the same bet on the betting exchange. This can seem daunting given that there are so many betting markets but start with the markets below which usually have the closest matches. Home/Draw/Away win on football matches in top leagues such as the Premier League. Televised matches are also a good option. If there are a number of Premier League football matches taking place on the day, you should be able to find a match close to 95% relatively easily. To check the match %, simply enter the bet details into a matched betting calculator and see what your qualifying loss is. If it is 5% or less than your back stake, then you have found a good match. Some matched betting calculators such as the one on ProfitSquad will tell you the match % when you enter the details into the calculator. Finding matches for free bets is slightly different to finding matches for qualifying bets. The main difference is that you want to find a match which has odds of 5.0 or greater. This will return a much higher profit overall than using your free bets on lower odds. With free bets, we aim to retain around 80% of the free bet value as cash after our bet has settled. This means that if we have a £10 free bet, we’d aim to turn it into £8 cash. If we were using the odds matcher, we could see some examples of 80% matches such as below. You’ll notice that the column is labelled ‘SNR %’. This means ‘Stake Not Returned’ and applied to free bets since you don’t retain the value of the free bet after it has settled. Just the winnings. With an 80% match, our bet would return £8 from a £10 free bet. The screenshot below shows the return from the top match in the image above. To find a match manually for your free bets, simply compare the odds on the bookmaker to those on the exchange like you would for finding a qualifying bet manually. These markets tend to have higher odds and so are perfect for free bets. Any match with an SNR % of 80% or above is great. If you find that a bookmaker is not included in the odds matcher you are using, you may be able to avoid finding a match manually if the bookmaker shares odds with another bookmaker which is included. Many bookmakers use the same odds. For example, Betfred and Totesport have the same odds as they are owned by the same company, as do BetVictor and McBookie or Boylesports and BetMcLean. It’s worth taking a quick look to see if the bookie you are placing a bet with share the odds with another bookie which is included in the odds matcher as it could save you time as well as allow you to find a better match and make more profit.